It is rare to find an interesting recording project like this, produced by the historic Folkways Records label, which has always been involved in electronic music, despite its name. The peculiarity of this album is not so much in the musical proposal – very respectable – but in the possibility of listening to some musical works commented on by their authors. 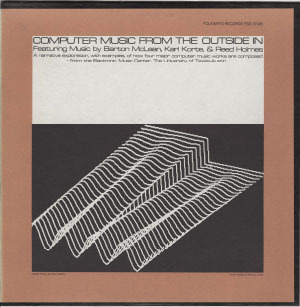 The format “Outside In” is an interesting approach to music composed by electronic means and had been experimented three years before with the Electronic Music From the Outside In album, dedicated to analog electronics. 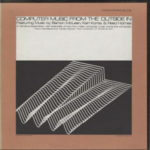 The second installment of this path is dedicated to computer music, an editorial approach that still today would be very interesting and useful, not only when applied to computer music, although – among the various areas of music – it is the one that has more difficulty finding the space for a wide dissemination, suffering from the common opinion that “the computer does everything by itself”. If you want read the linear notes, here the link. Do you know other interesting and not very popular publications?